Earwig conversations that make the buzz of a crowded pub restaurant and thread them together into a London Underground map. For the July meeting of Husthwaite's Orchard Village Club at the Plum and Partridge let us start on the Pub Line. It runs from Lynn who negotiated a special deal with the pub management and hosts the occasion. Here she is chatting with everyone as she visits the tables. Tactfully she reminds club members she wants a fiver from them and a tenner from their visitors. Next stop on the Pub Line is Gill, a key member of OVC's catering team. She has worked with Lynn on negotiating the menu. It's chicken with seasonal veg followed by fruit crumble. As landlord of this very pub in its Blacksmith's Arms days, her father was a prominent member of the village community. The Pub Line comes back to the sunshine for a quick call at station Charlie. Here's the lad himself, dapper in his P+P waiter's outfit, as he nips about the room. He's polite, he's attentive, he has an eye for detail. He's happy in his work. No doubt he's on his way, as bright young folk are, to uni or world travel. Treasure him while he's with us. Change here for the green line - the Hollinrake Line. Mind the gap. This line begins in Russia .... with our own Malcolm no less, as he counts in Russian to the delight of Tattyana. She's visiting the Hollinrakes on an annual school trip and is struggling in the babble of English voices. Malcolm has made her day. Two more Hollinrake Line stops. Nicky has a busy life but she keeps an eye on the OVC and on Primetime. She is delighted that her mother, Christine - formerly landlady of Crake's Durham Ox - is a happy Primetime regular. Change here for the Old Timers Line. Christine is among friends, starting with Phyllis, who has returned to the OVC after her 3-month stay in hospital. Let's hope her poorly leg has been well enough mended to get her about again. 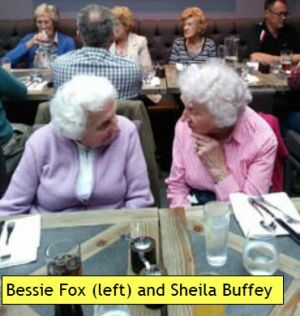 What a relief to be with her lifetime friends Bessie and Sheila! John has arrived too, favouring us at the expense of one of his annual 3-day visits to the Great Yorkshire. Good decision, John; it's pouring with rain all day in Harrogate. For a bonus the lady at his table is Barbara. Robin asks if they know each other, a polite enquiry greeted with a shout of laughter. Know each other! He delivered milk to her house in Prospect Cottages for more years than they'll bother counting today. And so we arrive at Dot, back on the Pub Line. She has looked forward to this occasion. Her father in law, Frank Edward Moncaster, was licensee of the Blacksmith's Arms from 1937, and Dot gazes around in wonder, trying her hardest to make sense of her old haunt's new layout.